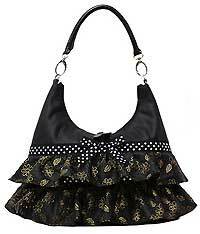 Hobo bag in black with ruffles on the front and back with cut out flower designs and gold trim, a black and white polkadot trim, and a matching bow on the front. This bag is made from a soft and flexible pleather and has a secure top zipper, a rolled handle, and silver hardware. 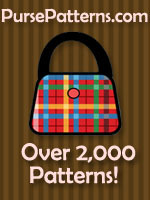 There are 4 purse feet on the bottom and inside is fully lined with 2 open pockets and an additional zippered pocket. 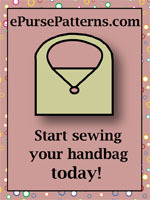 Measurements are 15" W(at widest point at the bottom of the bag) x 8 1/2" (at lowest point of handbag top)x 4 1/4"D.